New Year’s Day! Holiday after a long time and I am basking in the winter sun, staring particularly at nothing, enjoying uncensored Laziness! Then a cold wind passes by, and my eye catches the Bougainville branch moving along the wind. 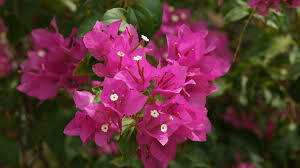 I see the Bougainville tree, in my garden, at least twice a day; when I go to college, and when I come back from work. I have been seeing the plant , for the past 8 or 9 years, or more. It has always been here! I have admired it, when its full of Pink lovely blossoms; cursed it when its leaves drop and litter our porch; watered sometimes; felt sorry for it when my father trimmed t short. But today, I am thinking what it feels like to be this Bougainville! I look at the branch that is swinging with the wind! The leaves are sprouting, must be a growing branch. The pink sepals are budding too. There are few thorns to it, not prickly, but thorns for the sake of thorns. I look to its other branches, cartwheeling in all directions, unruly; despite my father’s best efforts! Tied to the rope and going all the way to our balcony all the way from the ground; bridging the ants to our balcony!